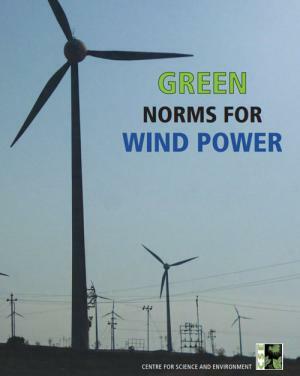 Wind energy makes up the majority - about 70 per cent - of the total renewable energy capacity installed in India. By the end of March 2013, India had a total installed capacity of 19,051 megawatt (MW), with 1,699 MW installed in 2012-131. The total wind power generation in 2011-12 was 23,399.5 gigawatt hour (GWh)2, or about three and a half times the output of a new 1,000-MW nuclear reactor. The 12th Five Year Plan aims to install 15,000 MW between 2012 and 2017, which will almost double the total capacity of wind power in India. Assuming an average wind turbine capacity of 1.5 MW4, this means a total of 10,000 new turbines in the country. Most of the installed wind power in India is concentrated in two areas - the southern states of Tamil Nadu, Karnataka and Andhra Pradesh and the western states of Maharashtra, Rajasthan and Gujarat (see Table 1). The most heavily utilised area is a corridor of high wind speed running east-westerly through Tamil Nadu and into Karnataka (see Map 1). With many of the sites in Tamil Nadu being saturated, and with other problems such as delayed payment and lagging grid extension dodging the southern states, it is probable that much of the planned 15,000 MW will come up in new, hitherto untapped areas. Despite the planned surge in growth, the sector has been hamstrung by multiple constraints. Historically, wind power capacity installation had come about through accelerated depreciation benefits, which were tax benefits. This facility has since been removed as it did not improve the generation efficiency of the plants. The sector also suffers from a lack of sufficient grid capacity to evacuate power from wind projects. In most of the states, availability of land for wind farms is another contentious issue. Even if private lands are available, conversion of land use status from agricultural to non-agricultural is a time consuming process. This is why forest land is seen as an easier alternative and developers want forest land for wind power development.